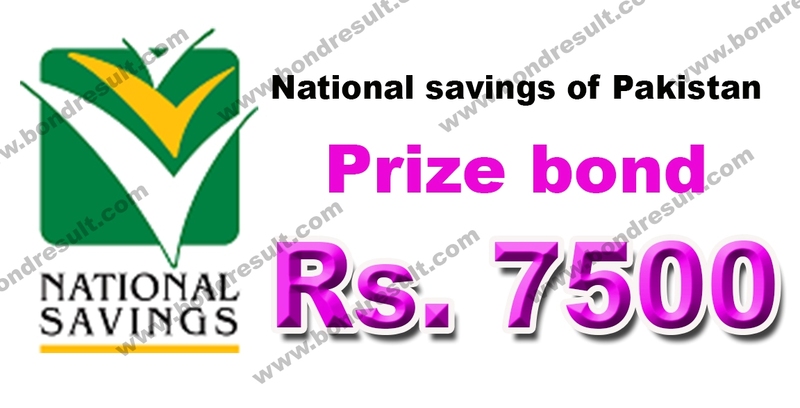 Here you can download and save offline National savings of Pakistan Prize bond 7500 List 2019 & all Lucky Draw lists results 2019 by savings.gov.pk online. You are to download Prize bond 7500 List 2019 current draws of the year and previous draws that can be withdrawn till to date. The time of winning lucky number withdraw from SBP is 6 years and you can search from the list where your number is and if you fall in previous 6 years year to tenure. The Rs.7500 Prize bond is unique bond having a lot of security features that impart a good security for its recheck. The people of Pakistan ever try to invest in these kinds on prize bond schemes. This is medium range prize bond and has very good prizes as compared to its low and high-cost prize bonds. The first prize of Rs. 7500 Prize bond draw 2019 is Rs. 15,000,000/- (1 Crore & fifty Lac or 15 Million PKR) that is for only one lucky winner of the whole draw serials. The 2nd prize amount is Rs.5,000,000/- (Fifty Lac Rupee or 05 Million PKR) that will be given to three lucky winners in a single draw. And the third prize amount of Seventy Five Hundred Prize bond is OF RS.93,000/- (Ninety Three Thousand rupee) that have 1696 prizes for the investors of National savings certificates. The chance of this bond to win is more the 15000, 25000 and 40000 as this cost low and prizes are enough high near to the mentions comparative bonds. The page Prize bond 7500 List results 2019 is to share all draws of the current year and previous years draw on the single page. The draws are sorted yearly and then 1 to 4 draw serial number in each year. You can find any draw easily and get a search with the help of browser search by pressing ctrl+F and find you winning digits. Now you can look into you related draw and find from the Rs.7500 Prize bond list 2019 and previous draws here.